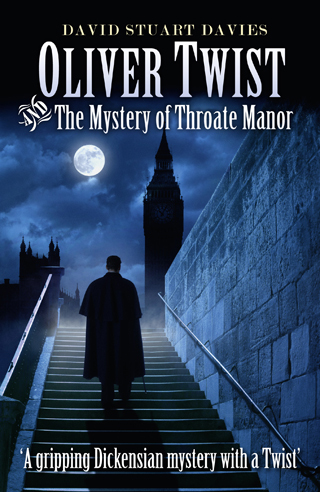 David Stuart Davies’s new book ​Oliver Twist and The Mystery of Throate Manor, is a rollicking ride through the dichotomy of the murky and murderous world of Victorian England, and the elite and wealthy who exist alongside it. It also throws in Dickensian characters Oliver Twist and Jack Dawkins, aka the Artful Dodger, both of whom have grown into respectable men, Oliver being a lawyer and Jack his assistant. Oliver is intelligent and has great empathy, whilst Jack is a loyal worker who still possesses many of the survival skills born of his Fagin days. These he uses to great effect when in a tight corner. Borrowing characters from other books is a risky business, and in this case Oliver and Jack are twenty years older, but do still contain elements of the personalities which Dickens gave them, superbly in fact as far as Jack/the Artful Dodger is concerned. It is also satisfying to note that, although Oliver consistently begs Jack to toe the line, he is nevertheless grateful when he doesn’t. The plot has Oliver burdened with the task of finding the long-lost son and heir of the owner of Throate Manor, who also has a younger son, Jeremiah, who is determined his older, but illegitimate brother, should never be found and never inherit the great wealth he considers his due. Jeremiah is a dyed-in-the- wool villain who glories in his wickedness, but can never see any consequences to his actions. There are murders a-plenty and the variety of various demises is laudable in their diversity. The characters are divided clearly into goodies and baddies, and their journey towards success or retribution is fairly predictable, but with an edge of farce to it that is amusing. The story also contains the best comeuppance scene of any potential murderer I have ever read, and one which would fit sublimely into a ​Carry On film. Although Dickensian in setting and nature, the book is not heavily into ‘Victoriana’. There is no heavy descriptive scenes of the poor and downtrodden, and in no way does it set out to moralise on the many social injustices of the period. These are merely accepted into the great scheme of things and never interfere with the story. Oliver is given a commanding empathy which sits well with Jack’s devil-may-care attitude, and tells the reader that this is a ripping yarn for enjoyment and not a comment on history. The book is described as ‘A gripping Dickensian mystery with a Twist’, and certainly it has a Twist, but ‘gripping’ it is not. It is, nevertheless, a fast-paced, amusing and well-written tale.